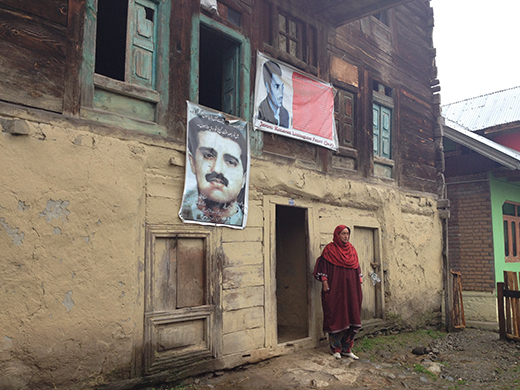 Mehmooda outside the house in Trehgam Kupwara, where she and her siblings grew up. On the date of court hearing of her brother in Srinagar, Mehmooda wakes up before dawn and finishes all the household chores, so that she isn’t late at the Srinagar court to see her brother, Zahoor. She boards the bus for Srinagar from Kupwara and keeps praying throughout the journey that Police presents her brother, before the court. Sometimes her prayers are answered; sometimes she consoles herself and hopes for the meeting at next hearing. Mehmooda is the sister of Jammu and Kashmir Liberation Front (JKLF) founder Mohammad Maqbool Bhat, who is relentlessly following the case of her imprisoned and only alive brother Zahoor Ahmad Bhat, who returned from Muzaffarabad, Pakistan Administered Kashmir in 2009 after 20 years. Mehmooda, who seems to be around 40, is married just few metres away from her mother’s home, in Trehgam. She keeps all the records and files of Zahoor’s case, notes all the hearing dates and travels alone from Kupwara to have a glimpse of her brother. “I don’t beg them (government) to release my brother. I know that they want Zahoor to shun politics, but how can he?” Mehmooda asks, in a strong tone, while her big eyes flash. On the polling day of 2008 assembly elections in Kupwara, Mehmooda’s fearlessness and courage proved to be a daunting task for the police and CRPF to bring situation under control in Trehgam, when Mehmooda, feeling ‘betrayed’ by the large number of people thronging polling booths to cast votes, took on the street, alone. Zahoor Ahmad Bhat, younger brother of Mohammad Maqbool Bhat who was hanged by Indian government on 11 February, 1984, returned to Kashmir along with his wife and three children, through Nepal border, after spending 20 years in Pakistan Administered Kashmir. On his return, Zahoor addressed a massive public rally on the 25th death anniversary of his brother in his native village of Trehgam, Kupwara, drawing mass support from the people, who rallied behind him and apparently behind the legacy of Bhat family. During the last three decades, Bhat family has lost its four sons to the ‘freedom struggle’ in Jammu and Kashmir. The only left brother, Zahoor Ahmad, was arrested a day after his return by police on the charges of ‘unlawful activities’. After his arrest on February 11, 2009 when Zahoor was addressing a huge gathering at Trehgam, Police station Trehgam registered a case under FIR NO. 09/2009 u/s 13 U.L.A Act, 2/3 E&IMCO against Zahoor and instantly presented a challan before the court on February 14. On 23 rd May, 2009, Zahoor was detained under Public Safety Act (PSA) and lodged in Kot Bhalwal jail Jammu. On 21st January 2010, Jammu and Kashmir High Court, Srinagar quashed the PSA slapped on Zahoor. Shahmala Begum, mother of Mohammad Maqbool Bhat. According to the family, in the five years span of his return to Kashmir valley, Zahoor has remained free for only one and a half year, and that too for brief periods of time. 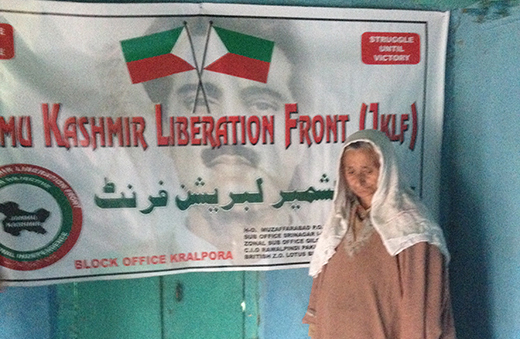 “We also get some monetary help from JKLF on monthly basis,” she says, while claiming that she is yet to make all the payment of the house, the family bought in Srinagar. Zahoor had crossed over to Pakistan in the initial years of armed struggle in valley, where according to police he received arms and ammunition training at Peshawar training camp. Later, Zahoor was associated with JKLF (Aman) group in Muzaffarabad. 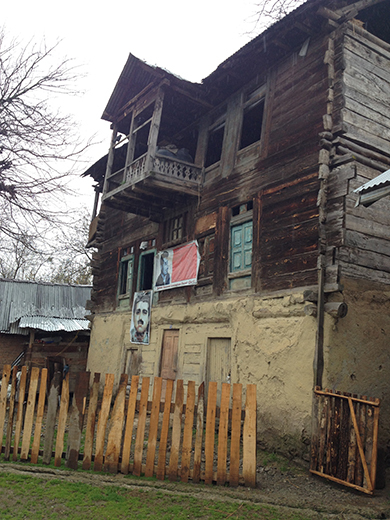 Apart from being one of the senior leaders of JKLF in PaK, Zahoor was in the business of property dealing. “I sold my jewellery and other valuables to buy a house in Srinagar, so that we don’t face the continuous harassment at the hands of Police and STF,” Aamina says, while sitting in one of the rooms of her newly bought house at Hawal in the old city of Srinagar. After Zahoor started ‘preaching the message of his brother’ again, he became a regular target for the police and other agencies. In 2010, when the valley was engulfed in the peaceful mass protests against the India rule, Police and Special Task Force (STF) repeatedly raided the house of Bhat family in Trehgam, frightening his family and children. “My only request to the Police was to keep Zahoor in Central jail, Srinagar, so I can visit him regularly, but despite that they shifted him to Kot Balwal Jail, Jammu,” Zahoor’s sister, Mehmooda says. “I told a senior Police official directly that we have shunned the gun but we will not stop asking for Aazadi,” she says. “I am on the brink of grave and Zahoor thought that he has the responsibility to shoulder my coffin. So he returned,” Zahoor’s mother, Shahmala Begum says. The house of Bhat family in Trehgam. In October 2013, Army arrested five former militants – who had returned to Kashmir over the last few years via Nepal border, surrendered and spent some time in detention – along with their families in Keran sector. According to the Army, the families were trying to cross over to PaK by crossing the highly guarded Kishen Ganga River. One of the five former militants arrested was Zahoor Ahmad Bhat, with his wife and four children. According to the case records, Zahoor was arrested by Police station Keran on 22 October, 2013 and shifted to Kupwara. While being in the custody of Police in Kupwara, Zahoor was implicated in case FIR No. 12/2013 under section 4 of Public Safety Act. On October 28 District Magistrate Kupwara vide order No. 11/DMK/PSA ordered the detention of Zahoor under Public Safety Act. The order also directed Zahoor to be shifted to Sub jail Hira Nagar and detained under preventive custody. Zahoor’s mother, Shahmala Begum, challenged the detention order before High court through a writ petition no. HCP 110/2013. While the writ petition was in pendency, Jammu and Kashmir Home department on 27 December 2013 ordered the revocation of PSA and directed the immediate release of Zahoor from custody. According to the case records, Zahoor was not given the copy of the revocation order and as such he copied the same in his own handwriting. On the same day the Jammu and Kashmir Home department passed a fresh detention order against Zahoor under section 19 (2) of Public Safety Act and directed that Zahoor be lodged at Sub jail Hira Nagar. Shahmala Begum again challenged the new detention order against her son before High court through the medium of writ petition and while the new writ petition was still in pendency, the detention order of Zahoor was again revoked and was shifted from Sub jail Hira Nagar to Central Intelligence Kashmir (CIK) Humhama. After remaining detained ‘illegally’ in the custody of CIK for several days, Zahoor was implicated in Hyderpora army convoy attack case registered under FIR No. 200/2013 under section 302, 120, 120 B RPC, 7/27 Arms Act in Police station Budgam and was taken to Central jail Srinagar. It is worth mentioning that the investigations of the said FIR have already been completed and the case thereof has been already presented before the Lower division court of Forest Magistrate Srinagar in November 2013 and which after committal is presently pending for trial against four accused persons before the Court of 1st Additional Sessions Judge, Srinagar. The most interesting revelation in the supplementary challan presented by police before the Lower division Chief Judicial Magistrate (CJM) Srinagar is that police, in addition to Zahoor, has named Nazir Ahmad Chechi as another accused in the said FIR but the accused has been shown as absconding in the same report and has been put at proceedings under 512 Cr.P.C. However, the case records show that Nazir Ahmad Chechi was already in the custody of state and was booked under PSA, and on the same day was brought before the Lower division CJM for execution of the PSA warrant. When this fact was brought before the CJM, the Magistrate sought an explanation from the police authorities and returned the challan to them to be presented before doing the needful, while the accused was sent to judicial custody. Further, the legal records show that police authorities instead of rectifying the challan sent a requisition of detention of Zahoor Ahmad to the District Magistrate Budgam. In March, Police booked Zahoor Ahmad Bhat for murder and criminal conspiracy in the 24, June 2013, Hyderpora attack on Army convoy in which eight army men were killed. Further, the police investigators in its supplementary charge sheet said that Zahoor is affiliated with Lashkar-e-Toiba (LeT)-the group believed to be behind the attack. According to the grounds of detention presented by the District Superintendent of Police Budgam, one of the charges on Zahoor is that on 07 March 2014 when Police component Budgam and officials of Police Post Airport apprehended him at Humhama, a Photostat letter pad page of Lashkar-e-Toiba (LeT) was recovered from his possession. “The contents of the seized letter pad page reveals that you (Zahoor) were involved in the hatching of criminal conspiracy with other terrorists who attacked an army convoy near Hyderpora Bypass, which resulted in the killing of 08 Army and severe injuries to the other army Jawans for which a case FIR No. 200/2013 U/S 302, 120, 120 B RPC, 7/27 Arms Act stands registered in Police Station Budgam. On 29 March 2014, District Magistrate Budgam vide order no. DMB/PSA?07 of 2014 passed a detention order under the section 8 of J&K Public Safety Act, 1978, for the preventive custody of Zahoor at Central jail Kot Bhalwal, Jammu. As per the detention order passed by District Magistrate, Budgam on March 29, at present Zahoor, 40, is in judicial remand in the Hyderpora attack case and has also been booked under the Public Safety Act (PSA) in the same case.